US Secretary of State Pompeo says US wants countries to be aware of Chinese cyber-threat, praises US-Israel alliance. US Secretary of State Mike Pompeo suggested that the US may be forced to downgrade its intelligence cooperation with Israel over the Jewish State's growing ties with China. Pompeo was asked about the the Israel-China ties, a rare sore spot in US-Israel relations under the Trump Administration, during an interview with Barak Ravid on Channel 13 News. "China broadly presents a real opportunity," he acknowledged. "They’re an economic powerhouse and there are lots of opportunities that countries have to do business with China. When China behaves transparently, when China is engaged in real economic transactions, we are untroubled. When China behaves using debt as a trap, when China bribes, when China engages in spying through its commercial state-owned enterprises, and presents risk through its technology systems – companies like Huawei which present real risk to the people of Israel – when those things happen, we want to make sure that countries know about it, know the risks, and then countries will make their own sovereign decisions. We’ll have to do the same." "I want to make sure that every country is wide-eyed and awake with respect to the threats that are posed by China and then make sure they understand as well America will have to make decisions too. If certain systems go in certain places, then America’s efforts to work alongside you will be more difficult, and in some cases, we won’t be able to do so. When asked if intelligence cooperation could be adversely affected, Pompeo replied: "Intelligence sharing might have to be reduced, co-location of security facilities might have to be reduced. We want to make sure that countries understand this and know these risks." Pompeo presented a brighter picture of the US-Israel relationship during the rest of the interview, including his visit to the Western Wall with Prime Minister Netanyahu. "I was honored to be at the Western Wall any time, but it was especially nice to be there with the prime minister of Israel. There’s no policy change. I wanted to go there, be there, and I’m really happy that I had that opportunity. We had the chance, too, to go down and see the tunnels, some of the history, some of the amazing history of the Jewish people here, dating back thousands of years. That history was special; the moment with the prime minister was special. And it’s always great to be in the city of Jerusalem. 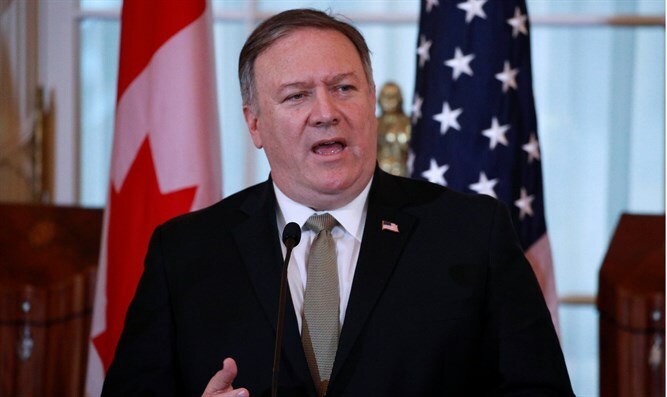 When asked about the long-awaited US peace plan, Pompeo said: "What you’ll see, when you see the plan, is you will see a vision for what we believe is a carefully thought out process by which a good outcome can be delivered for all the people in the region. We hope everyone will see that, we hope the Arabs, the Europeans, the Palestinians, the Israelis, everyone will – who will ultimately have some say and provide their input will see it for what it is: a sincere effort to resolve this long-time conflict." The secretary gave another interview with Yonit Levi of News 12. Pompeo dismissed concerns about the closeness of his visit to Israel to Israel's upcoming elections on April 9. "So my trip and, frankly, the prime minister’s visit to Washington next week, are about really – real pressing issues, things that matter to the world. They are time-sensitive, whether it’s the challenges that are presented by the Islamic Republic of Iran or the issues in Syria. These are issues that can’t wait, and they don’t work on election clocks. Our mission is to work the power of the United States and Israel together against these common threats, and it’s why I’m here today and I know it’s what the President and prime minister will talk about next week as well. He also said that US-Israel relations will continue to be warm even if a new prime minister is elected next month. "The history of the relationship between our two countries is deep. It is strong. It survives presidents and prime ministers. It is truly between the two nations where its peoples have shared common value sets, two democracies, two nations that care deeply about the well-being of their people, and two nations that share a set of common threats as well. He said that the administration's chief concern in the region is countering the Iranian threat in all its aspects, from its nuclear program to its support for terrorists. "So the way we think about this is in a broader context, right. The objective is stability in the Middle East and peace and less violence in the Middle East and fewer times where there are crises here in the Middle East. That’s the objective. "Today, the primary mover for malign influence in the Middle East is the Islamic Republic of Iran, whether that’s the assassination campaign in Europe, the funding of the Houthis, the money that goes to Hamas and Hezbollah, the support for the PMCs in Iraq, the malfeasance in Syria. The list of Iranian aggression and threats to the world is long. What we’re asking Iran to do is simply stop those things, to behave like a normal nation, like we ask every other country to behave. If they do those things, we’ll all move forward together. "As for the JCPOA, look, it was a disastrous deal. It guaranteed that Iran would have a path to a nuclear weapon. It was unacceptable. It was unacceptable for America, it was unacceptable for Israel, in our judgment an unacceptable risk to the world. So we withdrew from that. Today, we’re engaged in a pressure campaign to convince the Iranian regime to stay away from the nuclear weapons program, to stay away from developing that nuclear capability, and to engage in the world in a way that normal nations do." The interviews were given before President Trump's statement that the US should recognize Israel's sovereignty on the Golan Heights, and he therefore did not address the issue.